As I mentioned in my previous post, the weather has bee absolutely horrific. To the point that my job was closed as of Tuesday of last week. By Thursday morning I was feeling a little stir crazy since I hadn't stepped foot outside since Monday evening. I decided to brave the weather and drive to the shopping center that has a Marshall's, Ross and Target right by my house. Half way through my little excursion I realized that maybe this hadn't been such a good idea since there was ice all over the place. But when I got to Ross, I changed my mind. It was one of those days where you find a million things you want or need. And with these kinds of stores it's hit or miss. Sometimes they have tons of stuff and other times they have nothing. To my surprise they had a pasta machine on clearance for 19 bucks. How could I pass up the opportunity to try my hand at fresh pasta? Here is the recipe and pictures of my first attempt, which I must say was a huge success. I'll post the Spaghetti Carbonara recipe I made using the fresh pasta next time. 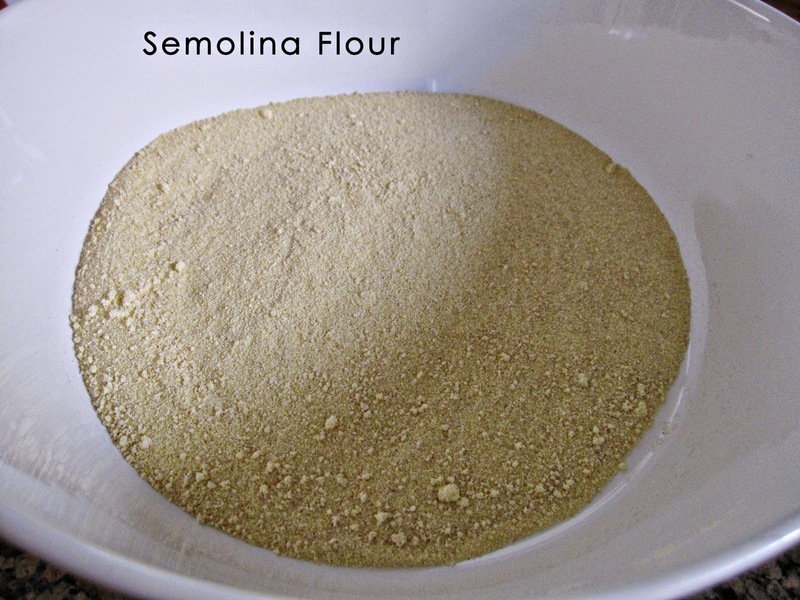 Combine the semolina flour, the regular flour and the salt in a bowl. Using a whisk or fork, blend everything really well. I totally cheated and used my bread machine to do the kneading for me. 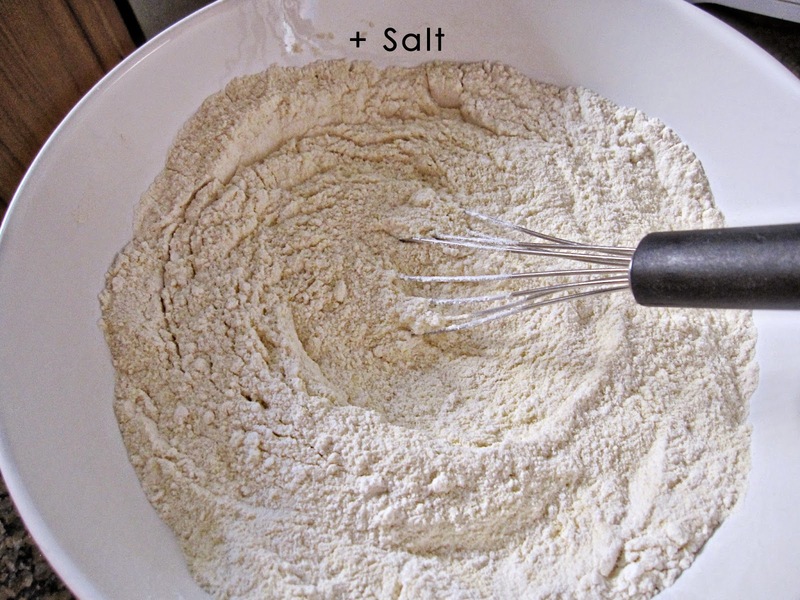 If you have a bread machine just add all of the dry ingredients to the bowl and create a well with your finger or spatula to drop the eggs and oil into. Use the "dough" setting and allow the machine to do all of the work while you sip on a glass of wine or something. You could also use a food processor or a stand mixer with the dough attachment too. If you don't have any of these what you'd do is mix the flour and dump it onto a work surface. Then you'd create a well in the center and add in the eggs. 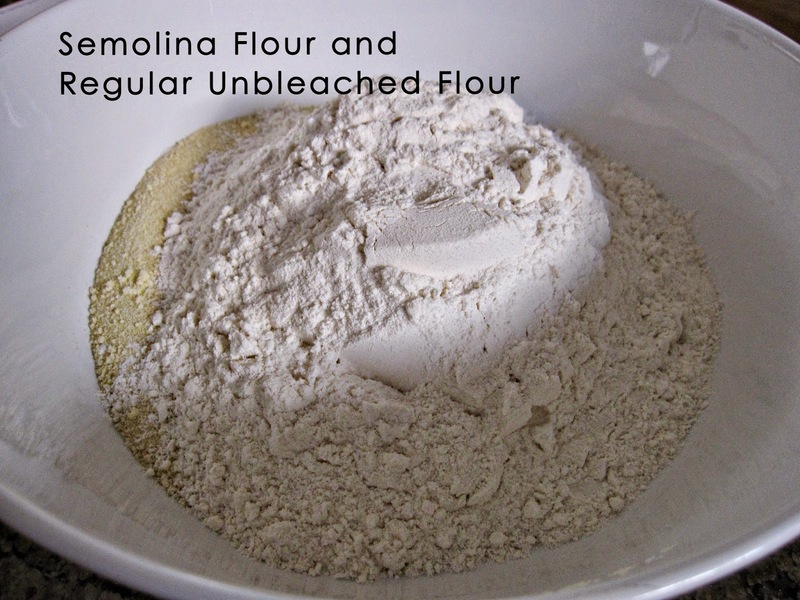 Combine all of the ingredients well and knead until the dough comes together nicely. It doesn't matter how to get there, but whatever method you choose, you'll want to follow with these next steps. Create a ball of dough, wrap in plastic wrap and then refrigerate for 30 minutes before rolling it out. Set up your pasta machine. Flour a work surface close to the machine so you'll have a place to lay the pasta and dust it with flour to prevent sticking. Now to begin rolling it. First, press down on the ball of dough to create a disk. Don't worry about getting it too flat. Using a serrated knife, cut a slice of dough and roll it out using a rolling pin. Adjust the dial of the pasta machine to your desired thickness and place the slab of dough over the top of the rollers. Turn the crank on the machine to create smooth, thin sheets of pasta. Run the sheet of pasta through one of cutting attachments. I used the spaghetti cutter since I was making Carbonara. If you were making lasagna you'd just use the flat sheet you had before cutting. You'd also use this to make shapes like ravioli or tortellini. Dust with a little flour to prevent sticking. When cooking, it's important to keep in mind that you'll only need to boil the pasta for 2-3 minutes. Awesome!!! I discovered fresh pasta last year, and wow--it's incredible. My Mom bought me a pasta maker attachment for my KitchenAid a few months later. I'm embarrassed to say I haven't used it yet--clearly that must change. I went through a stage where I obsessed about fresh pasta, perhaps I should dig up my pasta maker. 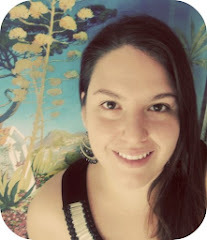 Your blog is very pretty, btw. Clean and uncluttered. Thanks Aunt Clara! I am glad you like the blog! One of my best friends is Dominican and she gave me the recipe to Pasteles which I hope to make sometime soon- if I can find banana leaves! Now that I've just devoted 2 hours on your website reading your posts, I'm hooked on your blog. I saved it as a favorite it to my bookmarks list and will be keeping track in the near future.